Macomb County is home to an advanced manufacturing infrastructure that features a convergence of technology, skilled trades and manufacturing expertise which combine to make Macomb County a preferred place to do business. The integration of knowledge-based information technology with traditional manufacturing resources is helping Macomb County companies become leaders in advanced manufacturing. More than 1,200 companies make up Macomb County's network of world-class innovators. Collectively, they employ almost 40,000 highly-skilled workers across fields of science, technology, engineering and math. These companies are utilizing sophisticated software systems. Companies continually integrate designing, prototyping, production and supply chain management, which lead to shorter product development cycles and increased manufacturing efficiencies. Macomb County companies compete brain-to-brain with national powerhouses such as California’s Silicon Valley, Boston’s Route 128 and North Carolina’s Research Triangle. Macomb’s advanced manufacturing industries produce everything from chemicals and electronics to machine tools and plastic. 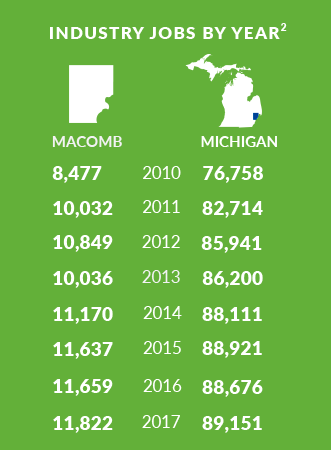 Macomb County's skilled and talented workforce has been a driving force in the prosperity of manufacturing within the county. As employment trends have highlighted an aging workforce, Macomb County has developed a number of inventive and impactful workforce development initiatives which are helping to both inject new talent into the workforce and prepare them to compete in a globally-competitive marketplace. There are also new programs available to assist companies in advancing the skill level of their current employees and keep them at the forefront of new manufacturing processes and procedures. Cougar Cutting Tools in Clinton Township was founded in 1987 with the belief that “you’re only as good as the last tool you made,” - a mantra that allowed the company to become a successful second generation family business. As a manufacturer of custom carbide tools, Cougar specializes in drills, end mills, reamers, form tools and other products for industrial machining applications. The company’s versatility utilizing lean manufacturing principles has allowed it to grow and expand into a second Clinton Township location. Schwab Industries is a premier supplier of tooling, stampings, gages and fixtures for aerospace, automotive and consumer industries. The company is also qualified to handle most aerospace production requirements and can accurately program the best tooling solution for all aerospace needs. Schwab has over 100,000-square-feet of manufacturing space divided between five buildings on one campus. The company is currently in the process of building a new 35,000-square-foot facility that will connect two existing buildings and utilize a lot on 23 Mile Road for parking and future building expansions. This development will allow Schwab to hire 20 new employees by the end of 2018. Macomb County is assisting with a 50 percent tax abatement on the new investment. Ultraform Industries is a leader in high volume precision metal-formed production parts for automotive, military and consumer product applications. Located in Romeo and employing 80 people, the company is investing over $1 million for the fourth time in the past five years. This time, aided by a local tax abatement, Ultraform is investing $4.2 million to add 30,000-square-feet to their 50,000-square-foot facility, as well as 15 new full-time jobs. This new investment will help support a new program from Toyota. In business for 55 years, Ultraform Industries also serves the aerospace, medical and alternative energy industries. 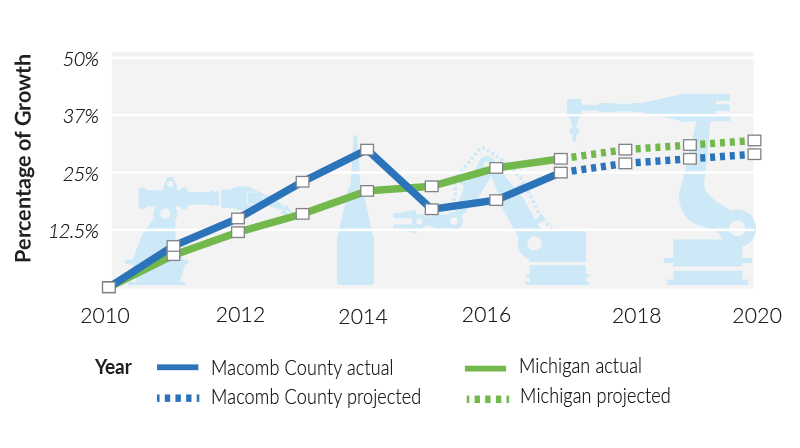 Macomb County, working with the local community, has offered support to the project in the form of a property tax abatement, reducing taxes on the investment by 50 percent for 12 years.